It seems strange that something so common as mold could be as dangerous as it is. Mold, however, produces something called mycotoxin, which is what scientists believe makes people and pets sick. 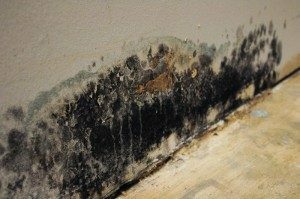 Mold has been proven to aggravate allergies and asthma, and is considered a significant health risk for the very young and very old, as well as pregnant women. To make matters worse, mold spores are kind of like pollen, in that they can float around your house even after you’ve killed the main source. This can cause ongoing health problems and also lead to mold continuing to grow and flourish, even after you’ve killed it. Mold growth starts in as little as 48–72 hours after water damage occurs. If left untreated it can spread at an alarming rate, especially in warm and wet months of the year. Mold remediation involves repeated cleanings. We first HEPA vacuum the area, after we’ve removed any structural materials that have mold (such as drywall). We then sanitize, HEPA vacuum again, damp wipe, and HEPA vacuum horizontal surfaces after that. We will Pack Out things like furniture to clean them away from the affected area. With mold, you are cleaning spores that are about 3-7 microns in size (a human hair is about 75 microns), so you have to perform repeated cleanings to make sure you get it all and can pass the test we perform to ensure the job is done. Just killing mold isn’t enough because of the mycotoxins stay with the dead mold, and the spores can still be floating around the house waiting to take hold again. We have access to a certified Industrial Hygienist for mold sampling and testing, including air quality conditions. This allows us to guarantee that we have brought the mold spores content back to normal, which typically means the same or less as what you find outside. Our mold remediation work is guaranteed. If we do not pass a clearance test, we will re-clean and pay for an additional clearance test at our expense. We start with an inspection and evaluation of your home. A contracted hygienist will take scientific samples of mold and moisture levels before we begin. We explain what we need to do, in what order, and why it’s important. We’ll also explain how long it will take us to restore your home to pre-mold conditions. We will work directly with your insurance company, so that you don’t have to worry about billing or paperwork. We do all the cleaning. A third-party hygienist does testing to ensure your home is mold-free, and that the moisture levels are reduced when we’re finished. We provide Pack Out Services if needed (moving your furniture and other valuables to our safe and secure warehouse) so we can remediate the mold. When ready, we can move all your items back into your home.